I grew up in the country outside of Cincinnati, Ohio, inspired by art and nature. Art filled our house; my mother who was an artist, taught me, and encouraged play. My father owned a bookstore, and brought many books home. I’ve been drawing most of my life. The last few years I’ve transitioned to new loves of creating paper cuts, many incorporating words, and books arts. I make handmade books and stitch pages, that use pen, ink and embroidery thread. I love the tactile quality coming from the thread and the touch of the paper. 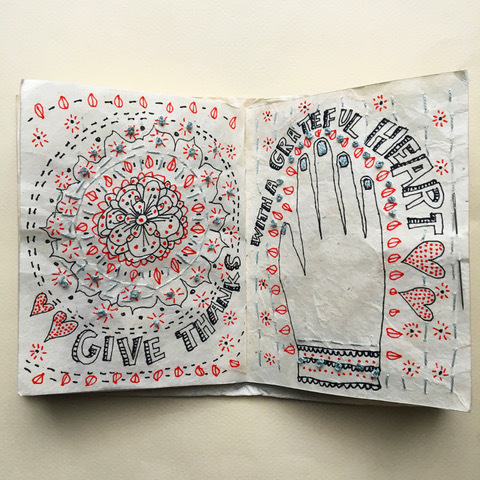 I am inspired by folk-art, patterns, quotes, and nature. Born into an upper-middle-class family, Van Gogh drew as a child and was serious, quiet and thoughtful. As a young man he worked as an art dealer, often travelling, but became depressed after he was transferred to London. He turned to religion and spent time as a Protestant missionary in southern Belgium. He drifted in ill health and solitude before taking up painting in 1881, having moved back home with his parents.